It is the world's largest producer of milk and also the largest consumer, and for good reason. Because in India, milk is not just the morning glass you drink before you sprint out of the house. Its uses go far beyond the dietary and nutritional. By the end of 2014, India was producing 140 million metric tons of milk per year - roughly 50 percent more than the United States, the second-biggest producer. Milk's special significance in India goes back to Hindu mythology and the legend of the Samudra manthan, the churning of the ocean that brought forth the drink of immortality, the amrit, and also the goddess Kamdhenu, which manifested itself as a wish-granting divine cow. Hindus, who make up 81 percent of India's 1.3 billion people, consider cows to be sacred embodiments of Kamdhenu. Krishna worshippers have special affection for cows because of the Hindu god's role as a cowherd. Stories about his love of butter are legendary, so much so that he is lovingly called "Makhan chor," or butter thief. Hindus use milk and its products for religious purposes because it is believed to have purifying qualities: ghee, or clarified butter, is used in lamps for rituals; milk is used to bathe Hindu idols on special occasions; sweets made from milk or ghee are used as offerings to gods. It accompanies so much of Hindu life, in rituals from an infant's first food to the last rituals after death. Milk also transcends religion: Ghee spread on flatbread can be a special treat for the poor; buttermilk is a popular summer drink to soothe the stomach. If you are in India, you cannot escape calorie-filled sweets made with milk. Another thing common across this large and diverse country is the morning cup of milky tea; tiny tea stalls start their businesses early, with migrant laborers normally the first customers. The dairy industry became the force it is today because of major changes decades ago. Amul, a co-operative dairy, was born in 1946 out of a revolt by milk producers against unfair trade practices, and now has 3.37 million members. Amul was a model for Operation Flood, a nationwide campaign to increase milk production that began in 1970. Many dairy operations are quite small. In a rural corner of India's northeastern Indian state of Assam, 24-year-old Srimoti Mandal milks her three cows in the early morning, getting an average of about 6 liters per day and selling it for about $3.50. With her husband unable to work because of asthma, she depends on the milk to support her family of four, which includes two young children. In a neighboring village, a bent Pronoti Devi, 67, supplies milk from her three cows daily to a tea shop. 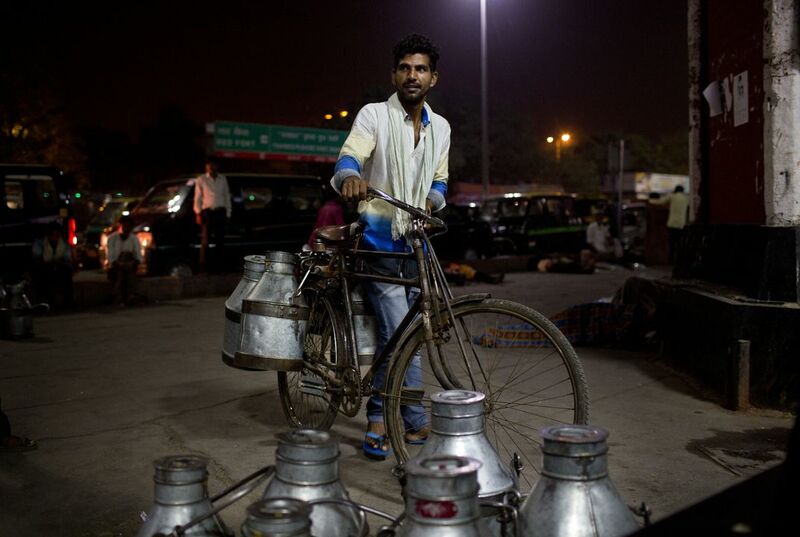 At 4:30 a.m., the New Delhi train station is bustling with milkmen from surrounding towns who arrive carrying cans of milk that they deliver to neighborhoods across the capital. Most were up hours before the sun's first rays. Some will make a second trip before the day ends and then they will return to feed the cattle that in turn help feed their families. Why is milk so important in India? That's a crazy amount of milk they use. I could never be able to drink that much milk. And what about people who are laktosintolerans? What do they do since they're supposed to be drinking all this milk? I would not like to have to drink all of that milk. I think milk is great. But that is just an excessive amount of milk to drink. It would keep your bones fairly strong, though. This article is very interesting to read, I found it very interesting that India produces 50% more milk than the United States does. I would expect the U.S to produce the most and not be the second. Milk is very important in India not only because of it's nutritional value, but also it's ability to feed families, "She depends on the milk to support her family of four," says Srimoti Mandal. Mandal milks her three cows every morning just to help support her family, as her husband cannot work because of his severe asthma. Mandal is not the only small dairy operations helping people feed their family, they are all over India. Another reason milk is imperative in India is it's religious appreciation, "Hindus use milking its products for religious purposes." Hindus use milk every single day, either for an offering to "Makhani Chor" or in rituals of infants or death. I found this article to be very interesting and I learned that milk is a staple food in India which I never would have thought about previously. Milk is a byproduct of cows, and cows are very sacred in India. So something made from the creature that a lot of your religion is based off should be used like it's special. Being used in religious ceremonies and everyday use, should be quite regular consistent when it comes to milk. Not to mention that it also helps the economy of India, with it being so popular and being sold at around $3.50 per 6 liters. Like the article stated, 81 percent of India's 1.3 billion population practice Hinduism and since Hindus use milk for its alleged purifying qualities, that is a reason why milk is essential in India. They use it in foods, desserts, and rituals. This article really captured my interest and suprised me because India is that last place I would think would be common for milk. I thought that either the mid-west, or even nothern Europe would be that largest milk producer. As Americans, we might drink milk on a daily basis and use it in our cooking, but in India milk is used for sacred reasons. I wonder if milk from India tastes any diferent that it does here? This article really captured my interest and surprised me because India is that last place I would think would be common for milk. I thought that either the mid-west, or even northern Europe would be that largest milk producer. As Americans, we might drink milk on a daily basis and use it in our cooking, but in India milk is used for sacred reasons. I wonder if milk from India tastes any different that it does here?